Oh MY!! I have been without internet all day. I kept calling and an automated message kept telling me there was an "interruption of service" in my area. Finally I waited f.o.r.e.v.e.r on the line to talk to a live person who told me she didn't see any outage in my area (though there must have been one at some point). She had to walk me through unplugging and resetting all sorts of things and I'm back! I am sorry if you came by to link up a dessert - please come back and link up now or anytime over the weekend! 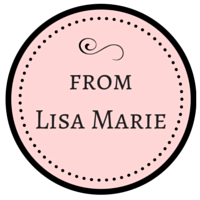 Today is the day you can link up any desserts - with or without chocolate - old or new posts. 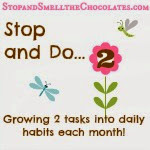 Or you can still link up a yummy chocolate post! Also, I had big plans to get another post out before this one as it is #200! So pretend that this is #199 and I'll do another post later tonight (Lord willing!). My Thanksgiving desserts turned out nicely and as a dedicated blogger, I HAD to take pictures of them! And none of them were chocolate - can you believe it? First was my usual Amaretto Cake which has become a Thanksgiving tradition and is loved by all. 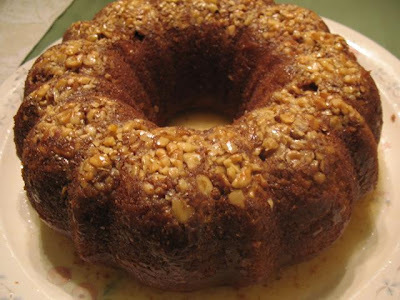 Super moist with a glaze and those are walnuts - yummy!! 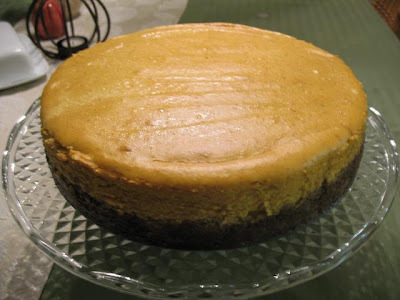 Next I made a Pumpkin Cheesecake with a recipe given to me by a friend (Thank you K!) and it turned out great - it was a hit! So rich and yummy with a gingersnap/pecan crust! Isn't it pretty? And I can tell you that it was delicious 'cause I might have had a piece...or two...or something like that. 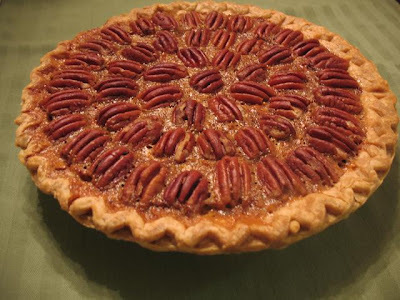 :) I confess I did not make the crust - Marie Callendar was kind enough to make one, package it up, and put it in the freezer section of my grocery store - she's the best, isn't she?! OK - enough of that! I am gaining more weight just sitting here looking at these pics! 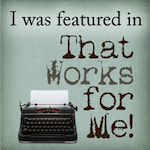 Bring me your yummy chocolate and/or dessert posts and link away, link away, link away all! Oh being without internet can be very frustrating! I'm glad you're back at it! All of them look delicious, but especially the pecan pie. Yummy, Yummy, Yummy! Your desserts are all beautiful. Almost and I mean almost to good looking to eat! I just saw your side bar and saw you have a little side business I need to check out! Oh the pie looks beautiful!!!! You did a GREAT job of making it all pretty! I hope it really did taste good. I NEVER make my own crust, we have Pillsbury here and I even had a coupon for it!!! Did you put some REAL whipping cream on top? You know, just in case you did not get enough calories with just the pie!? I made two pies, I kept a pound of chopped nuts, for I really like the chopped ones better, but they are NOT as pretty! Certainly easier to cut and eat! I am glad you shared your pictures, all three desserts looked great!